The allure of gold is as old as civilization itself. Egyptian goldsmiths were melting gold down almost 6000 years ago with blowtorches made of clay. Possibly the most famous gold artifact in the world – the funeral mask of King Tutankhamen - was made over three thousand years ago from 10 Kg of high karat gold. Their gods were thought to have skin of gold so the funeral mask showed the pharoah in his divine form in the afer-life. Gold chains were first produced in the city of Ur (modern day Iraq) in 2500 BC. The first pure gold coins with stamped images are credited to king Croesus of Lydia (modern day western Turkey) around 550 BC and it's referred to often in the bible. In the 16th Century, Incas of Peru considered gold to be the sweat of the sun god Inti. In ancient Colombia powdered gold was used to cover the body of the future king in coronation ceremonies, giving rise to the legend of El Dorado (the Golden One). Our long held veneration of gold as an otherworldly material is arguably justified when considered it comes from outer space. It is thought to have been present in the dust that formed the Solar System, including planet earth. Almost all of the gold present when the earth was formed 4.5 billion years ago melted with iron and got sucked into our planet's molten core through magnetic forces. The gold that is on the earth's surface (the stuff we mine) was delivered by later asteroid impacts about 4 billion years ago. The same meteorites that punched out the craters we see on the moon today. So we’re not likely to get more gold any time soon. It really is a precious metal. Gold needs to be pulled out of the ground, or mined. In 2007 China overtook South Africa as the world's largest gold producer, the first time since 1905 that South Africa has not been the largest. South Africa is now in sixth place behind (in order) Australia, Russia, the United States, Canada, and Peru. Other major producers are the Ghana, Burkina Faso, Mali, Indonesia and Uzbekistan. Mining projects can broadly be divided into large scale and small scale. Each has strengths and weaknesses. Larger scale modern extraction companies are required to meet fairly strict social and environmental standards to comply with consent conditions. They tend to use fully mechanised extraction and processing methods, meaning humans aren’t used for much of the dangerous work. That does mean though that the ratio of societal value in large-scale mining is much lower than in small-scale mining. Small-scale mines employ more people rather than being mechanised and the revenue stays in the community. These large scale gold mining projects can also leave insanely massive holes in the ground (some of which can be seen from space) resulting in significant biodiversity loss and community displacement . According to UNEP (United Nations Environment Programme) up to 20% of the world's gold output originates from artisanal or small-scale mining. That figure is larger than any single producer. In some developing countries such as the Phillipines, that number is as high as 80%. The small-scale mining sector, much of which is illegal and unregulated, is expanding worldwide faster than at anytime in history. The miners are at the start of a long and complex supply chain and are vulnerable to exploitation. They struggle to make enough money to invest in the safer, more efficient technology that would remove some of their daily risk. These artisanal or small-scale mines (ASSM) do not have the same standards of environmental, social or occupational health and safety regulations. There is an estimated 10 to 20 million prospectors now active in more than 60 countries in these small mines, representing around 90% of the global gold mining work force. Fairtrade UK puts the number higher at 100 million people. But its not about demonising these small, unregulated mines. I spoke with a friend in Kenya who runs a company called Eco Centric Kenya, Edward Muriuki. Eco Centric's current focus is working with these small-scale artisanal mining communities to improve occupational health & safety, introduce effective, fit for purpose modern mining technology and promote environmental protection. Their objective is to ensure wealth creation for communities most affected by poverty or marginalisation. “I believe large scale anything is becoming a redundant way of doing things. It only really benefits a select few. Large (mining projects) mostly cut out the local communities. With artisanal mining the wealth is distributed among the local communities. Technical knowledge transfer can happen more easily within small scale projects too”. The OECD 'Due Diligence Guidance for Responsible Supply Chains of Minerals from Conflict-Affected and High-Risk Areas' also encourages buying ASSM gold, provided that mining activities are legitimate and that adequate due diligence is carried out and risks are identified and managed accordingly. It specifies that mining activities cannot be considered legitimate when they "contribute to conflict and serious abuses associated with the extraction, transport or trade of minerals". Gold is a limited resource, so by definition it is an unsustainable material - we can’t keep digging it up forever. Unless we get a fresh meteor shower, once it’s dug up that’s it. And we're digging up around 2,500 tonnes per year. Ethical gold, however, does exist. Just like any substance in the earth that we humans pull out for our own use, it all comes down to how it’s mined; how well the environmental and social impacts are managed. Let’s take a look at a few of the key problems associated with the extraction of gold, and what some of our options are to invest in pieces that haven’t damaged people or the planet. The most commonly used method for leaching gold out of the surrounding material in the ground (ore) involves dissolving the gold with a concentrated cyanide solution, allowing the gold liquid to run away for collection. Despite being used in 90% of gold production production, cyanidation is controversial due to the toxic nature of cyanide and leaks are not uncommon. While cyanide does not persist in the environment, improper storage, handling and waste management can have severe human health and environmental effects. When cyanidation is practiced on mercury contaminated waste from a gold site, it increases the mobility of mercury in the environment. Large scale mines have largely abandoned mercury use, however, according to UNEP it is still commonly used in small-scale gold mines around the world. Small-scale miners are thought to be using more mercury per year than any other single sector. UNEP estimates that they use roughly 1600 tonnes of mercury annually to produce around 450 tonnes of gold. This accounts for approximately a quarter of the global consumption of mercury. Mercury is bad for human health and the environment, but because it’s cheap and quick, artisanal miners tend to use it. Miners pour mercury into ground ore where it merges with gold flecks to form an amalgam - essentially a ball - of mercury and gold. The ball is then burnt to evaporate the mercury so that a tiny porous nugget of gold is all that’s left. Miners working on this evaporation are consistently exposed to mercury vapours many times above concentration levels considered safe by the World Health Organization. Mercury is a nasty one in terms of human and environmental health. Excessive exposure to mercury, a neurological toxin, causes serious health problems, deformities and nervous system disorders. This year's UNEP Global Mercury Assessment found that small-scale gold mining accounts for 35% of mercury emitted into the air and directly threatens the health of an estimated 15 million miners in 70 countries-mainly in Africa, Asia and South America. The ILO estimates that nearly one million children between 5 and 7 years of age are engaged in small-scale mining and quarrying activities worldwide – the gold mining sector is included here. Almost all work performed by children in artisanal and small-scale mining is hazardous and has characteristics that fit the definition of a “worst form of child labour” under ILO Conventions. For example, Human Rights Watch claim children as young as eight years old are working in Tanzanian small-scale gold mines, with grave risks to their health and even their lives. 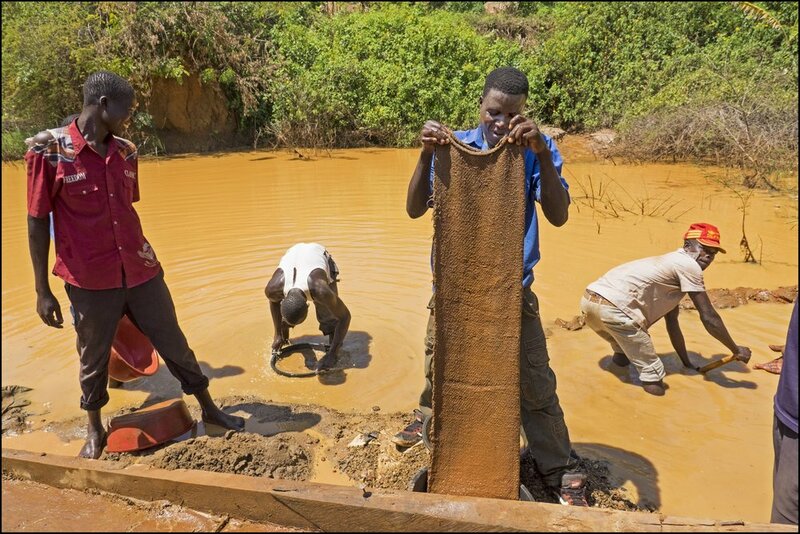 A report titled “Toxic Toil: Child Labor and Mercury Exposure in Tanzania’s Small-Scale Gold Mines,” describes how thousands of children work in licensed and unlicensed small-scale gold mines in Tanzania, Africa’s fourth-largest gold producer. They dig and drill in deep, unstable pits, work underground for shifts of up to 24 hours, and transport and crush heavy bags of gold ore. Children risk injury from pit collapses and accidents with tools, as well as long-term health damage from exposure to mercury, breathing dust, and carrying heavy loads. Gold is one of four most commonly mined "conflict minerals", the other three being tin, tantalum and tungsten. According to noted fair trade activist Greg Valero, the term conflict mineral refers to gold which has "...been sourced, extracted or processed in a situation of armed conflict and has contributed to financing and abetting armed groups or engendered human rights abuses." Basically, it's gold that is being used to fund fighting or straight out war. Much the same as ISIS uses oil revenue to finance its military and terrorist activities, gold is currently funding war in hotspots around the world. As of 2010, the conflict resource fuelling the world's deadliest war is gold in the Congo but also in surrounding countries of Kenya, Rwanda, South Sudan, Tanzania, Uganda and Zambia. There are several other issues with extracting gold which hold true for virtually any material being mined. Soil pollution from the creation of sulphuric acid, water pollution from acid being leached into local water tables, illegal dumping of hazardous waste and silica dust entering the atmosphere are all environmental risks associated with mining, including gold mining. Some mining experts have claimed that a single gold ring can produce up to 20 tonnes of waste. In 2015 Colarado's Animas River was turned bright orange following a gold mine waste water spill containing high levels of lead, arsenic, cadmium, and aluminium. Regardless of where the gold is pulled out of the ground, the final stage of mainstream gold production involves removing impurities that remain after the smelting process. This is called refining. Refining factories receive doré bars, as well as scrap gold, and melt it all down in a furnace. Because all that gold from various sources is melted down together, it’s impossible to separate out the ethically sourced (meaning sourced from mining projects where people and the environment are looked after) from gold from an unregulated mine or from conflict affected sites. Lack of transparency in global gold supply chains is a major challenge for consumers wanting to make more ethical purchase choices. So what can the consumer do? Ask questions of your local jewellers or jewellery suppliers - do they know where their gold comes from? Do they offer ethical, conflict-free gold? Where companies are claiming ethical sourcing, ask for more information to see what the claims are based on and for more information on the standards they are adhering to. Money makes the world go round, baby. It’s all about consumers showing that they will preferentially spend their money with jewellers who support safe mining operations. If suppliers know there is money in it, they'll be more likely to source ethically. Certified Fairtrade (note the single word spelling) gold can be traced from the mine through the refining process and into the final jewellery products. Licensed jewellers need to provide documentation of all transactions with the miners in order to become certified. Fairtrade Gold Standards include strict requirements on working conditions, health and safety, handling chemicals, women’s rights, child labour and protection of the environment. According to Fairtrade UK: “Fairtrade Gold miners receive a Fairtrade Premium of $2,000 per kilogramme of fine gold, on top of the guaranteed Fairtrade Minimum Price. Certified Fairtrade Gold miners receive a minimum of 95 percent of the internationally agreed price of gold as it is traded on the markets. The remaining five percent goes to other participants in the gold supply chain." Fairtrade UK has a large list of certified brands. Greg Valero is a total legend on the scene plus his website is packed with info for anyone who wants to read more. Here in New Zealand it's a bit trickier to find, Zoe Porter is one example to check out though, her site has got loads of cute designs. Do keep in mind just because a jeweller isn’t Fairtrade certified, doesn’t necessarily mean their gold is problematic. Auditing costs can be a barrier to smaller independent jewellers gaining certification. There are some great independent jewellers out there who have more direct relationships with miners of precious metals. You won’t always come across them on the high street or in malls, so it will take a little digging (excuse the pun). But they are out there! Searching “ethical gold”, “ethical jewellers”, “conflict free gold” is sure to deliver several hits. Ash Hilton is one such local hero here in NZ. You can check out the story of how they cleanly extract alluvial gold in the South Island using basically water here, and read a previous interview ESH ran with them here. They also use recycled Sterling Silver, Palladium and Platinum from old jewellery, silverware, industrial recycling and workshop scraps and sweepings from jewellery making and recycled diamonds. This is the company I recently went with to invest in a couple of heirloom gold rings that I want my sons to inherit someday. Knowing that no suffering to communities or the environment has been caused in the creation of the rings has given me a totally different emotional connection to the pieces. Sophie Divett is another great NZ based designer who uses conflict free and ethically or sustainably sourced materials. The Good Trade and The Independent have both recently collated some good lists of such jewellers too. Around 60% of gold used annually comes from newly mined sources. The rest is from recycled supplies such as old jewellery that has been melted down. Again, googling recycled or second hand jewlery in your local area is the most straight forward option. Many ethical jewellers (like Ash Hilton above) opt to source their precious metals and stones from recyclers rather than invest in materials from modern extraction projects and their associated issues. Walker and Hall here in NZ have a vintage section (interestingly they don't buy or sell Michael Hill jewellery because the quality isn't high enough). Webbs auction house is also a source of recycled jewellery.